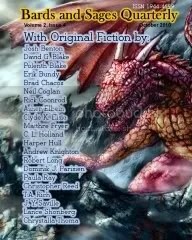 The October 2010 issue of speculative digest Bards and Sages Quarterly has an annoyed-looking maroon dragon on the cover. And as a bonus, it contains my story “Psi-mage for Hire”. See, I knew you’d be pleased. It’s available in print, pdf or Kindle format.